Hi Jo, option 2 is what Pete does – UHT milk plus full cream milk powder plus Greek yoghurt in the Easiyo thermos, then leave it for eight to twelve hours. We use our yoghurt for all sorts of things – I use it in all cake recipes that call for sour cream. I also mix a little with skim milk (UHT) and use it as a buttermilk substitute when I don’t have the real deal. We’ve also tried adding a little Greek yoghurt to cream to culture it before turning it into butter. You and Pete probably have a smaller carbon footprint with the thermos than the electric one, Celia! There is a little story about the only time I made yoghurt as a kid: my mother used to order two pots of cream each week from the milkman and they wouldn’t get used, so one day there were six cartons of cream in the fridge and I had read about making yoghurt with it and just took them all out and did it and offered it up for pudding. Forgot to say I feed the bread starter with a bit of yoghurt from time to time – you get a lovely sweet scented starter that way too! 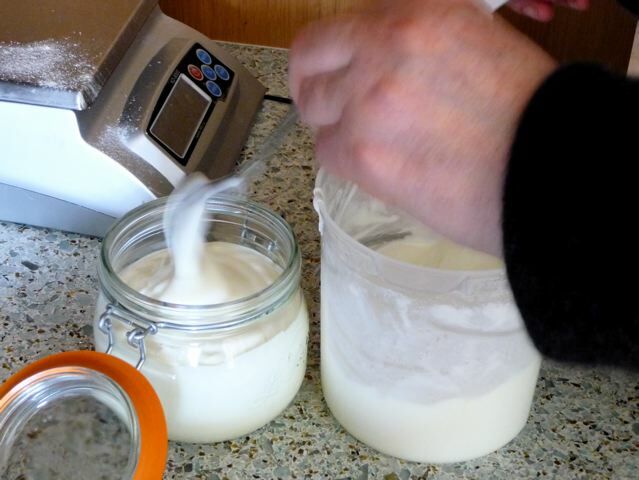 I’ve been so interested in making my own yogurt for ages . . . meant to try it last summer and then got so caught up in bread baking . . . maybe this summer! The kiddos eat yogurt every morning (often with granola) for breakfast. We use it in place of milk in our steel cut oats, too. Yum! Hi Abby – If you are eating it every day then give it a go! Then you can make whey bread and yoghurt cakes too! I haven’t made yogurt in a while, but last year we went through a stretch of months in a row with exclusively homemade yogurt in the house…. so good! I am a bit late to respond on this one ..pc problems..need I say more. The home made yoghurt is fabulous with toasted caramelised oatmeal ( Delia has a recipe on her web for Caledonian ice cream that is a perfect way to caramelise) and home made strawberry jam..layer in a glass..fool yourself it is good for you…enjoy….I got the inspiration from Pam the Jam in her lovely RiverCottage jam book. She recommends double cream and Drambuie so I have brought it down to earth. The whey makes a lovely loaf. Sounds delicious! Strangely enough I read something in a book yesterday called Cooking With Grains where the author makes icecream with toasted oatmeal, maybe it was a Delia recipe she was borrowing?